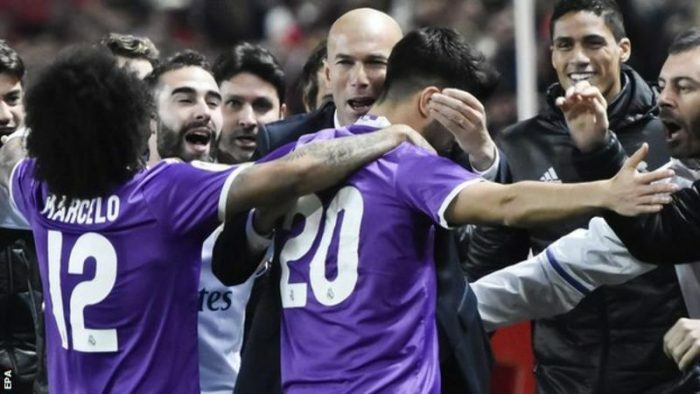 Real Madrid set a new Spanish record of 40 matches unbeaten as Karim Benzema’s 93rd-minute goal snatched a 3-3 draw at Sevilla in the Copa del Rey last 16. Zinedine Zidane’s side were last beaten by Wolfsburg in their Champions League quarter-final first leg in April. Barcelona held the previous record of 39 games, set under manager Luis Enrique between 2015 and 2016. Thursday’s draw means Real progress to the Copa del Rey quarter-finals as 6-3 winners on aggregate. Former Juventus, Real and France midfielder Zidane, 44, was appointed in January 2016 after two years managing their reserve team. He has since won more titles than he has lost matches – winning the Champions League, the Club World Cup and the Uefa Super Cup, while suffering only two defeats. Real have won 31 and drawn nine matches since their last defeat, scoring 115 goals and conceding 39. Barcelona won 32 games and drew seven across all competitions between October 2015 and March 2016. They won the league and cup double that season. With Sevilla heading for victory, Benzema exchanged backheels with Marcelo in midfield, drove into the box and fired home in the final minute of stoppage time. The home side had taken the lead through a Danilo own goal, before 20-year-old midfielder Marco Asensio equalised after running the length of the pitch following a Sevilla corner. Goals from Stevan Jovetic, on his debut after joining on loan from Inter Milan, and Vicente Iborra had given Joao Sampoli’s side further hope of victory. But a Sergio Ramos chipped penalty cut the lead to 3-2 in the 83rd minute, with Benzema’s late goal securing the dramatic draw.